Strange as it is, there are very few lakes on Thousand Lake Mountain. In just a few hundred yards, the trail begins to climb fairly aggressively. But at 0.4 mile, it reaches a hidden valley with a small lush meadow. This forest is reminiscent of forests much farther north, with moss growing in patches among the rocks and some areas that are a bit boggy. The trail bears left and then climbs some steep switchbacks up a craggy basalt escarpment. When you reach the top around 0.7 mile, you are standing on the edge of Flat Top, the plateau that forms the top of Thousand Lake Mountain. Sweeping views open up towards the east and you can see Factory Butte, the northern end of the Waterpocket Fold, much of Capitol Reef National Park, the Henry Mountains, the Abajo Mountains, and on a clear day the La Sal Mountains near Moab. The trail heads west across a clearing covered with basalt boulders and clusters of fir trees. The trail all but disappears at this point, so keep a sharp eye out for cairns. If there are no cairns, head west in a long, narrow meadow and you will reach the main north/south trail in a quarter-mile or so. You will want to turn left (south) along the main trail, but first continue west a few hundred feet to the western edge of Flat Top for an extraordinary view across the broad valley created by the Fremont River, Fishlake Hightop, the Sevier Plateau, and the Tushar Mountains. In the foreground you can see the western flank of Thousand Lake Mountain with rock slides that feather out into rolling, forest-covered country that is still high above the farms along the Fremont River. Return to the main trail. About a half-mile after leaving the overlook, you reach a spring with a log fence around it and the trail to Neff’s Reservoir. You continue straight on the trail that goes to Wiff’s Pasture and Snow Lake. For the next mile or two, there is a multitude of parallel cow paths–in one spot about a dozen–left by cattle on their way to the spring you just passed. At about 2.4 miles, you reach another junction and sign. To reach the top of Thousand Lake Mountain (a gentle rise poking above Flat Top) continue straight towards Wiff’s Pasture. After leaving the junction, continue across broad, open meadows for another mile or so until you see a grassy slope to your left, which is the final approach to one of the gentlest mountain tops you will likely ever climb. Leave the trail and walk up the slope until you come to a small rock outcrop with some weathered posts on top; this is the top of Thousand Lake Mountain. The view south has to be one of the most unusual on the entire Colorado Plateau. Directly in front of you is a huge green meadow ringed by a spruce-fir forest. Across the wide valley carved by the Fremont River, Boulder Mountain and the Aquarius Plateau rise to approximately the same elevation as Thousand Lake Mountain. The tops of red and white sandstone cliffs cupped in the valley are barely visible, while the jagged sandstone monoliths of the Waterpocket Fold in Capitol Reef National Park can be seen to the southeast. There are many promontories on the Colorado Plateau with stunning views, but few of them include a vast rolling alpine meadow. After signing the register in the old mailbox, return to the trail and take it until you reach the junction with the Snow Lake Trail. Here you have a choice—return the way you came, or turn right towards Snow Lake to complete a loop (the last 1.2 miles of the loop is along the road where you parked). 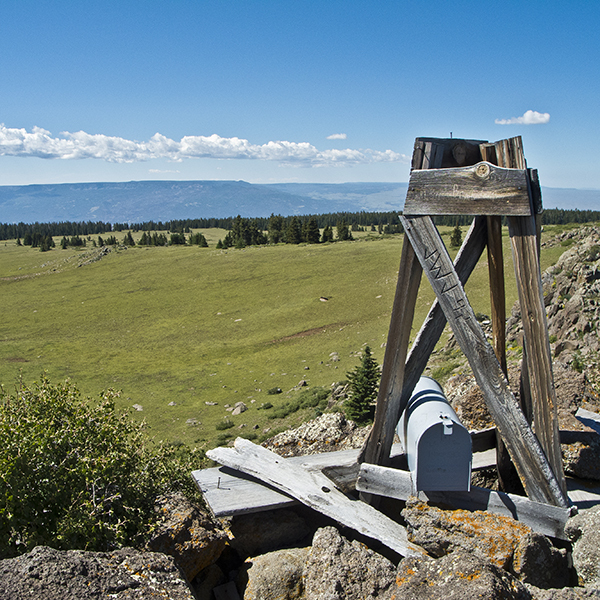 Leaving the junction, the trail crosses another large meadow, heading southeast towards the east side of Flat Top. A quarter-mile or so before the edge, it enters a forest where livestock have again created multiple trails; so keep your eyes open for cairns. There is a small opening where the trail reaches the escarpment and again you have sweeping views to the east. You can see Snow Lake below. The trail descends a series of switchbacks with some fairly loose rocks that require careful foot placement. After reaching the bottom, the trail crosses a bench that has recently been logged, so this section is not as nice as the earlier climb. After crossing a dirt road, the trail drops off the bench to Snow Lake, where you cut left and go around the northern end of the lake to the main road. Turn left and follow the road for about 1.2 miles back to the trailhead. Take UT 72 north from Loa, which joins UT 24 at the western edge of town. Drive north on UT 72 for 11.4 miles (going through Fremont) to Forest Road 206. Turn right and stay on FR 206 for 8 miles until you reach Elkhorn Campground. Turn left just before the campground at the sign for Snow Lake, drive about 2.5 miles and look for a small trailhead sign on the right side of the road. If you reach a bathroom and picnic area, you have gone a few hundred yards too far. It takes about an hour from Loa to reach the trailhead. About 10 miles (as the crow flies) north of Torrey, Utah, in the Fishlake National Forest. The drive to the trailhead is much longer. Speak up for forest restoration at a moment's notice. We send out timely emails notifying you of opportunities to submit comments, sign petitions, and take other actions on behalf of our public lands. Want to make a difference on the ground? We have several volunteer trips each year in Utah's Fishlake, Dixie, and Manti-La Sal national forests.